When it came to hammering German ground forces in the days after D-Day, Lockheed's outstanding P-38 Lightning gained an awesome reputation. 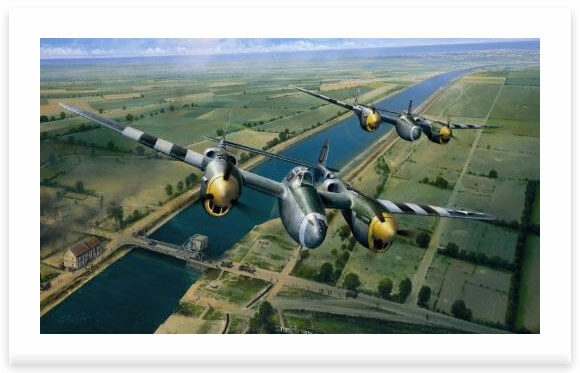 Richard Taylor's evocative new painting recreates the scene over Pegasus Bridge shortly after D-Day as a pair of P-38 Lightnings thunder inland in support of the advancing allied armies. Below, signs of the recent action are still plainly visible as trucks and their exhausted drivers hasten back to the beach-head to collect reinforcements. Each print signed by pilots who flew the P-38 in combat in Europe, together with veterans who fought on D-Day. Signed by two pilots who flew the Lockheed P-38 Lightning in Europe during World War II.